Sometimes I would like to place my family in a big, ole bubble. Safe from sadness…pain…fear…harm. Unfortunately, that utopia is not the world we live in today. I admit I try to create my own pseudo bubble. I rarely watch the news for two reasons. I never know what atrocity may be covered that I don’t want my kids to see. Secondly, I want to block out the evil in this world for myself too. On Friday evening, we were loaded up headed to dinner as a family when I was scrolling though Facebook and saw some references to Paris. 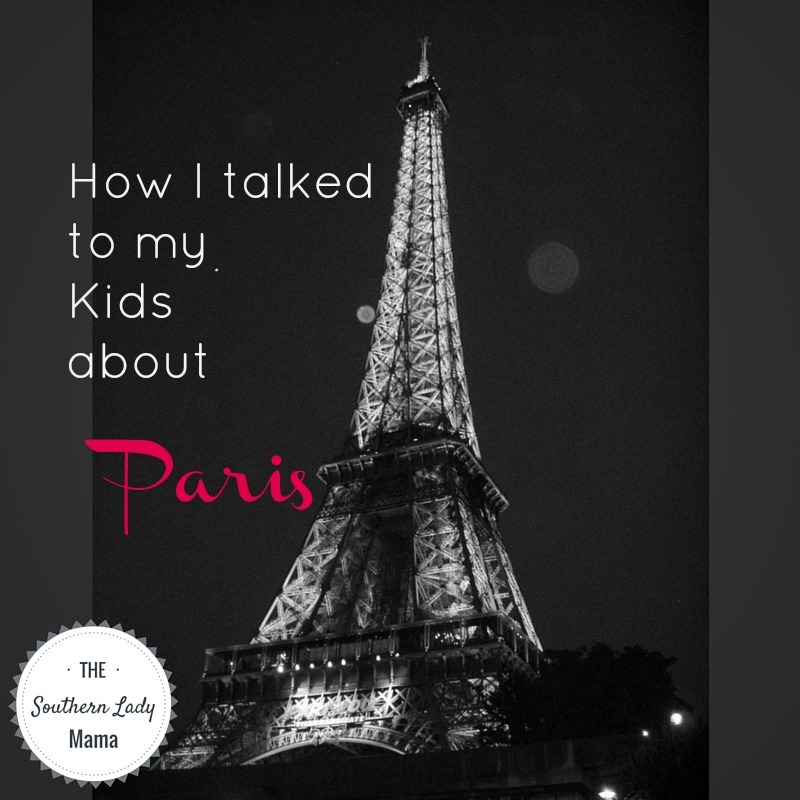 I glanced back at the kids who were chatting away and whispered to Eric, “What happened in Paris?” The details were still coming in, but what I heard was horrifying. We got to the restaurant and were surrounded by ten TVs. Nine of them had basketball and one had news coverage of the attacks in Paris. I silently willed Ethan’s eyes to stay trained on the Kentucky basketball game inside our bubble and away from the news channel. After we put the kids to bed, we turned on the TV news to get caught up on what was going on in Paris. It was heartbreaking to see all these innocent people terrorized and killed. It was apparent that it was an orchestrated terrorist attack on the people. We watched until one channel showed a particularly gruesome scene from one of the cafes. The commentator proudly boasted that they only showed this picture once an hour, left the image on the screen a few more moments than was appropriate, and then left it on even longer. I decided I had enough and went to bed to pray for Paris, to pray for the world leaders, and especially to pray for my children and this world in which we are rearing them. We are at a point where the bubble has burst. I knew I had to talk to my children about the tragedy and what it means to us. I have twins that are nine and a seven year old. It is not a conversation that is easy to have with kids, but I felt like they were old enough that I could have an age-appropriate conversation with them. Because here’s the deal: If I don’t take charge and talk to them about it, they will hear about it from somewhere else. It is my responsibility to make sure that they hear about the scary things in this world from me so that I can reassure them. I sat them down on Saturday and told them the high points about what happened in Paris. I didn’t go into a lot of details, but I let them know the truth. I told them that a group of radical Islamic people attacked and killed innocent people in Paris. We had talked about radical Islam before when they learned about September 11th. We also spent a lot of time talking about the difference of the majority of peaceful Muslims, like some of their friends at school, and radical Islam. My German teacher in high school, Frau Colley, used to always say, “All generalizations are false,” before she told us anything about the culture. That has stuck with me. I have also passed it on to my children. I am a Baptist and worship a loving, forgiving God. I would hate if I were lumped in with a well-known group of detestable Baptists. However, I did let them know that there is a group of hateful people that make it their mission to terrorize people. They do not worship God like we do. They do not know peace and love. They have a very twisted and evil form of their own religion that is based on hate. I also reassured them. Granted we do not know what the future brings, and we can speculate all we want about radical Islam infiltrating our country. But that is nowhere near appropriate to discuss with my children. This is my job: to assure them that Mama and Daddy will keep them safe, and to emphasize that the police officers and soldiers that we just celebrated on Veteran’s Day make it their life’s mission to keep them safe. They are learning about government in their Social Studies classes. We talked about the importance of electing politicians that will keep them safe. And the most important thing that they can do is to pray. We can pray to God to watch over us, our police, our armed forces, and our world leaders to help keep our children safe. In addition, I understand that all families will choose differently about how they address or not address the current events. For that reason, I also told them that they were not to discuss it at school or with their friends. As is my normal rule, they will never get in trouble if they come directly to their dad or me to talk about anything that they hear at school that upsets them, they don’t understand, or that just doesn’t sit right with them. However, if they talk to their siblings or friends about it, there will be consequences. They know and feel comfortable enough to always come to us first. The bubble has burst y’all. I am going to educate my children. I will support my law enforcement and armed forces. I will pray for the world leaders and educate myself before I vote in the next election so that I do my part to keep my babies safe. The world in which I was reared is not the world of today. I am so saddened that my grandchildren are faced with this reality. Our only hope is the hope and promise of our Lord Jesus. Thanks for sharing your heart.